1 2018-03-19T19:18:42+00:00 Liza Potts 2e4024b066fd3068a576ac52a252ea3d0f5ca650 1 1 Harry Potter fans have left writings, artworks, and objects at many participatory memory spaces. gallery 2018-03-19T19:18:42+00:00 Liza Potts 2e4024b066fd3068a576ac52a252ea3d0f5ca650 Layering Ianto's Memorial The Torchwood Ianto Jones space of memory in Cardiff Bay is a significant participatory memory site where the owners of Mermaid Quay have acknowledged this fan space. 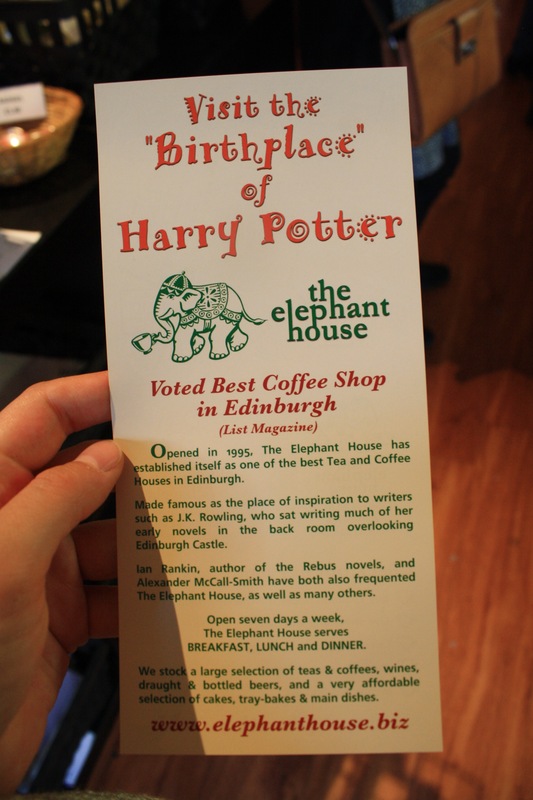 This ambient sound is meant to mimic a space of memory for Harry Potter: The Elephant House in Edinburgh, Scotland. This sound is based on the work of Freesound user Gordon Cowan (gordonjcowan), which can be found here. This section describes how we collected and analyzed our data. Above, you can scroll through these images to better understand the kind of memory writing fans created in this space. The audio describes the sort of noise you would expect from a lively tea shop or coffeehouse, helping you understand the kind of activity in a space like this. 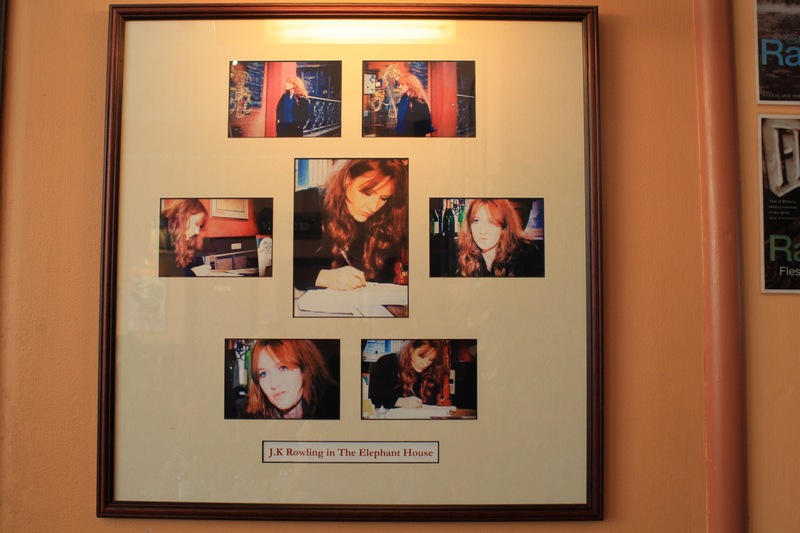 The walls at The Elephant House, where J.K. Rowling wrote part of the Harry Potter series, became the focus for our case study; the space provided one of few tangible examples of participatory memory in the Harry Potter fandom. 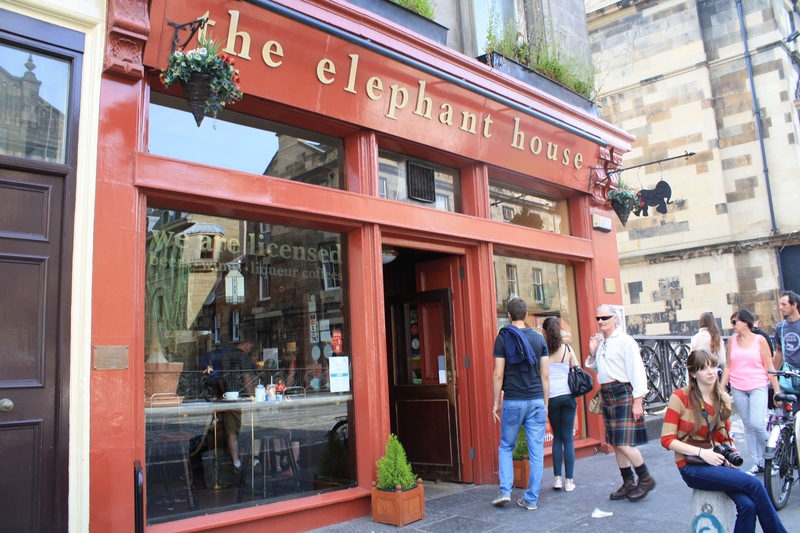 The Elephant House perfectly embodied the persistence of the fandom over time. 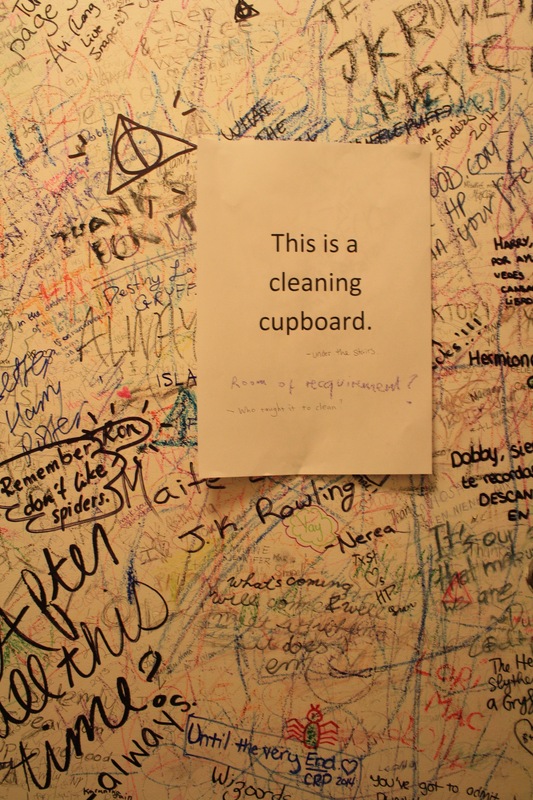 As noted in a newspaper article by Kirsty Stewart (2016), when the staff of the cafe attempted to paint over the writing, fans would retaliate and cover the walls in under a week, so the staff gave up on trying to keep the space free of fan writings. Much of the Harry Potter fandom exists online. Across Tumblrs, blogs, websites (such as MuggleNet, Leaky Cauldron, and Pottermore), and podcasts (such as MuggleCast, PotterCast, and Alohomora! ), fans have built and curated a multitude of spaces for their community. 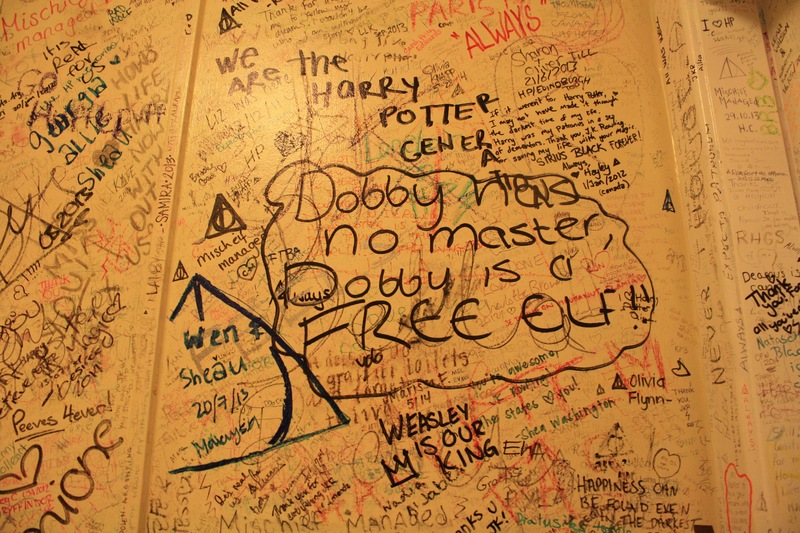 Fans can spend weeks, if not months, paging through content about memory spaces for Harry Potter in the United Kingdom and beyond. For US-based fans, the opportunity to travel to the United Kingdom can mean personally visiting these spaces. In the summer of 2014, this opportunity meant building a study abroad that allowed students to visit these places and take side trips across the UK to locate more sites of memory. 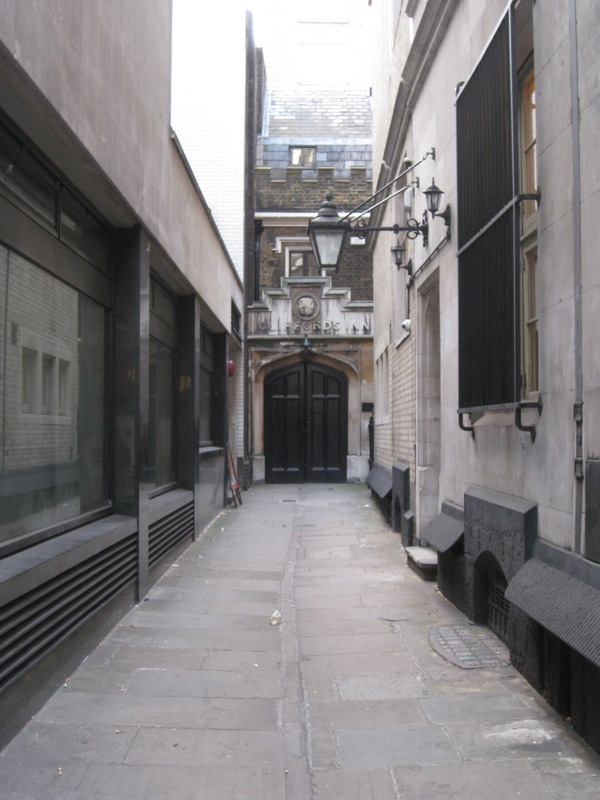 While these are just everyday spaces to Londoners, they are also locations of memory for the Harry Potter fandom. Before they left for study abroad, Emily and Kelly outlined the locations they wanted to visit outside of London. 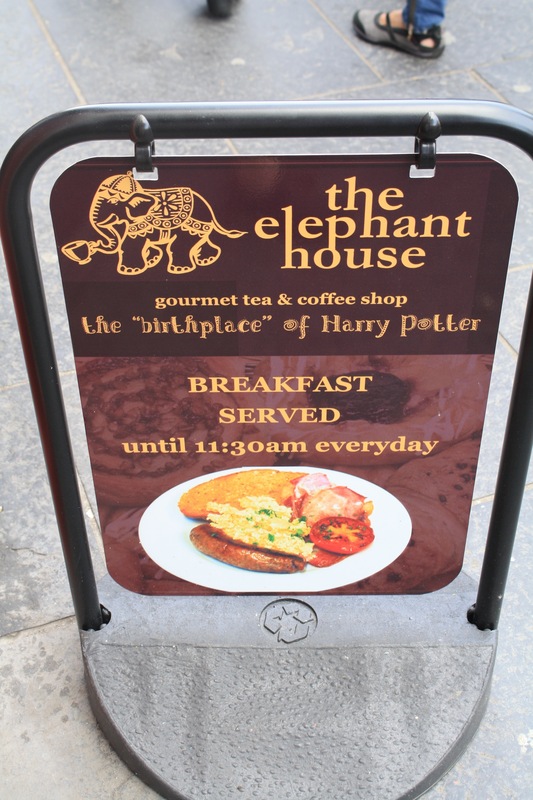 They planned to go to The Elephant House, Platform 9¾, and the Warner Brothers Studio Tour together. 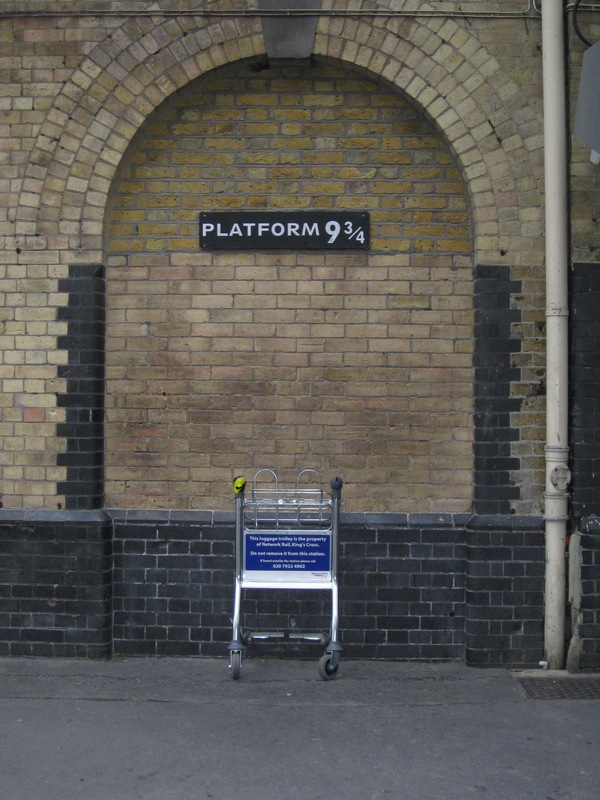 They planned to visit spaces that acted as the backdrop for filming, such as the locations used for the Leaky Cauldron, Millennium Bridge, and Westminster Station. They planned on visiting at least four times: once for themselves as fans, once with a tour for the experience, once for observation as a researcher, and once more after-hours visit when the public spaces were closed but still available for viewing. It was that last visit that proved the most significant, as it helped the two of them feel connected to their fandom in that quiet, solitary moment of their pilgrimage. In deciding on these side trips, Kelly and Emily considered Henry Jenkins (2012), who states, “there are questions we can only answer by examining our own emotional experiences with forms of culture that matter to us” (p. xii). They felt they could only begin to understand their own stance as researchers and their experiences as fans by reflecting on their interactions and immersing themselves in their fandom culture more deeply. They hoped to do this critical and exploratory work at three specific sites of memory: The Elephant House in Edinburgh, Platform 9¾ at King's Cross Station in London, and the Warner Brothers Studio Tour outside of London. In this section, we talk briefly about these spaces, focusing primarily on The Elephant House location as a space where participatory culture was most active. While Emily and Kelly possessed a fair amount of knowledge about Harry Potter, they were not as knowledgeable about other people’s experiences with the series. They wanted to use this study abroad to reflect on their own fan journeys online through Tumblr blogs and in person at conventions. The idea was to then compare their experiences to journeys taken by other fans. They followed up this research with a funded undergraduate research grant and continued this work throughout the following academic year with Liza at Michigan State University. 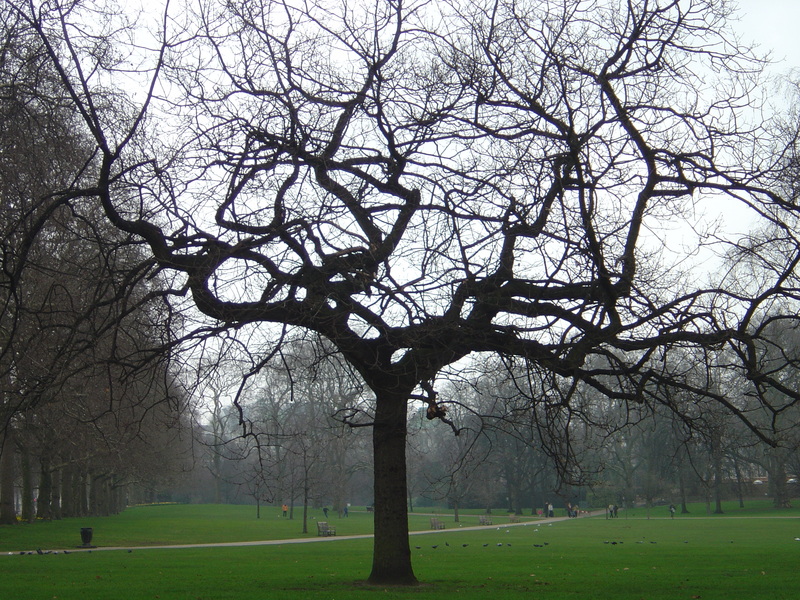 During the study abroad, the students quickly noticed that the physical spaces impacted them more than they expected. This experience helped them realize that they needed to explore more about these spaces and learn from other fans. To decide where they should focus on, they learned about which spaces were the most visited and interesting based on fan feedback. 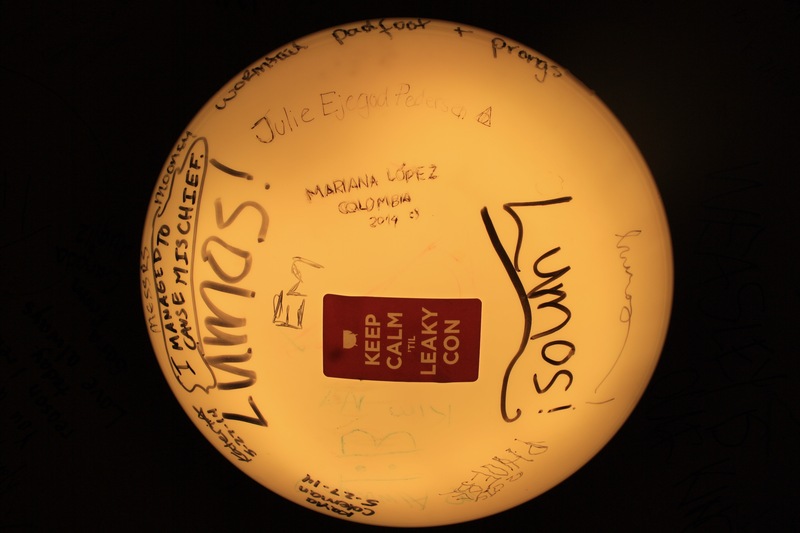 Turning to digital fan communities such as MuggleNet, Leaky Cauldron, fan blogs, and Pinterest, Emily and Kelly delved into fan and media perceptions of the series. They refreshed their memories on the details of the books and the films to better understand the differences in the translation from page to screen to physical space. By focusing on works by Jenkins (2004, 2013), they were able to gain a more lived and researched understanding of media convergence. For Kelly and Emily, much of this activity involved putting on “researcher goggles” and taking off “fan goggles.” These terms are in reference to how they approached the space and how they situated themselves as researchers and fans. Using this method, they were able to look at fandom in a critical, productive, thought-provoking way while still maintaining and understanding the significance behind the experience as fans. They were able to see what Jenkins (2004) meant when he stated, “media convergence is more than simply a technological shift. Convergence alters the relationship between existing technologies, industries, markets, genres and audiences” (p. 34). It was important for the study abroad students and myself to take notes about the space itself, including how it was set up, how fans interacted with it, how we, personally felt and experienced the space itself, and how it connected with the books or movies. The students took many of their notes via their smartphones. Most of the time, this note taking was for very specific observations of fan reactions, noting what they wanted to tweet or post about later in the digital spaces they were participating in. Although not traditionally thought of as a note-taking system, the students used Twitter to collect their notes and information. With Twitter, they created their own hashtag (#HPWHO), tweeting as a way to reflect on the experiences they were having. Each day, they would aggregate all of the tweets with that hashtag into their research journal. 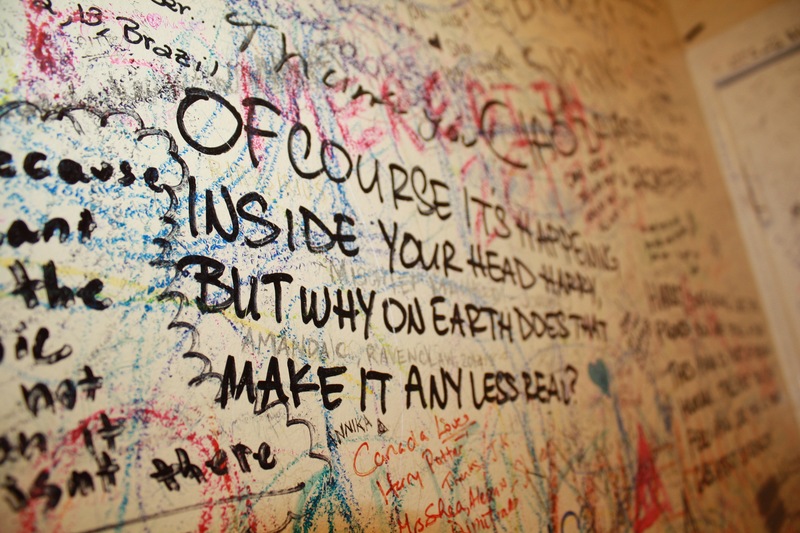 This platform forced them to condense and think about their thoughts in more specific ways. It also allowed them to easily reference past thoughts by finding specific tweets and building content on Storify, a digital storytelling tool. 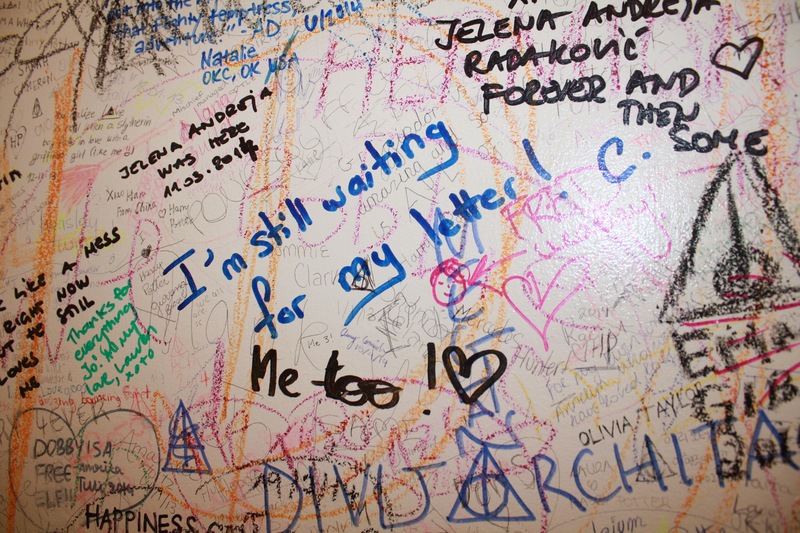 During the study abroad, Liza had one day planned to take the study abroad students to look at Harry Potter spaces of memory in London. 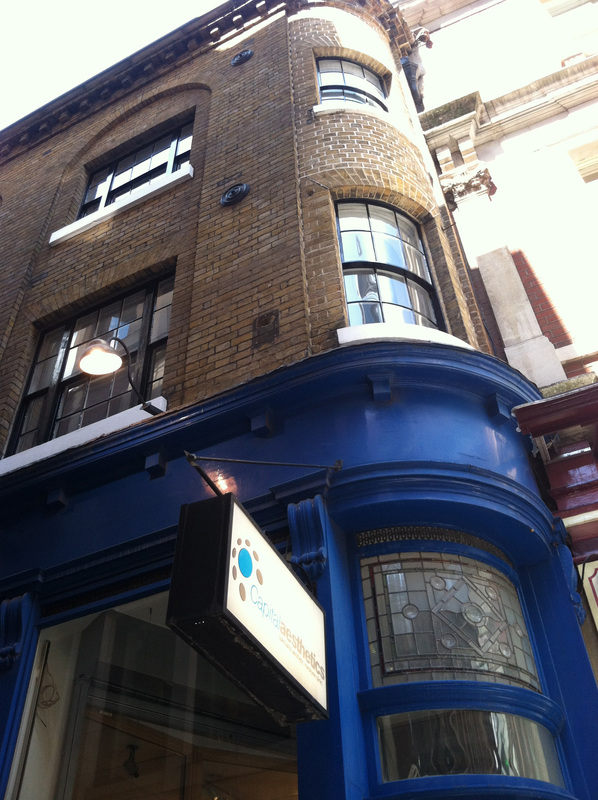 There were several locations outside of London that Emily and Kelly wanted to visit as part of their research, including The Elephant House and the Warner Brothers Studios Tour. Since these spaces are so iconic to the fandom, it was important to them as fans to personalize the moment and create a connection with the physical spaces. Kelly and Emily set aside extra time to visit these places of memory. They wanted to have a deep experience to “tie” themselves to the space and become part of the living narrative. 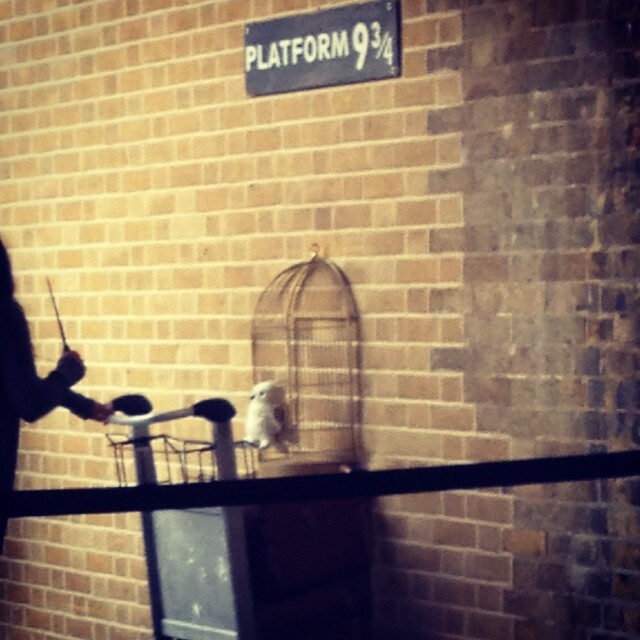 As a class, we had planned to visit Platform 9¾ inside of King's Cross Station. Emily and Kelly decided to visit this space a few times, on their own, ahead of time. 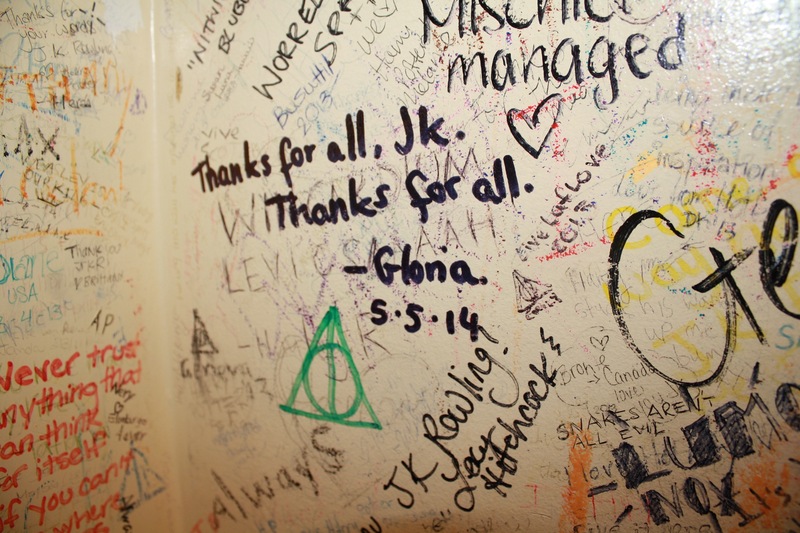 These advance trips allowed them to become familiar with the space before the class visit, which was spent informing students not as familiar with Harry Potter about this fandom. Their several visits allowed them, through trial and error, to participate how they wanted to participate within the space as fans and researchers. By visiting separately, they were able to provide insights for their classmates and encourage them to visit the space after hours when most tourists were gone. These repeated visits provided a multifaceted look at the space, including witnessing some of their classmates learn about the fandom for the first time. The spaces that were the most engaging allowed fans to not only participate, but also create a personalized, uninhibited experience for themselves. The ability to create an impression and make a mark on that space held the most value in terms of participation as both fans and researchers. Visiting and examining these spaces helped us learn more about writing and fan participation. There are two areas of focus for us as we analyze the participation at The Elephant House. First, we want to think through Edward Casey’s (2004) assertion that memory is connected to a past and that we must continue to act to ensure there will be a future to remembering (p. 17). This idea was always at the forefront of our minds as we as fans wondered what will happen as time passes. The students working on this project grew up with the Harry Potter series. Concerned that these spaces would somehow fall into memory, seeing the activity in this spaces and learning that the participants were from a wide variety of generations was reassuring to them as fans. 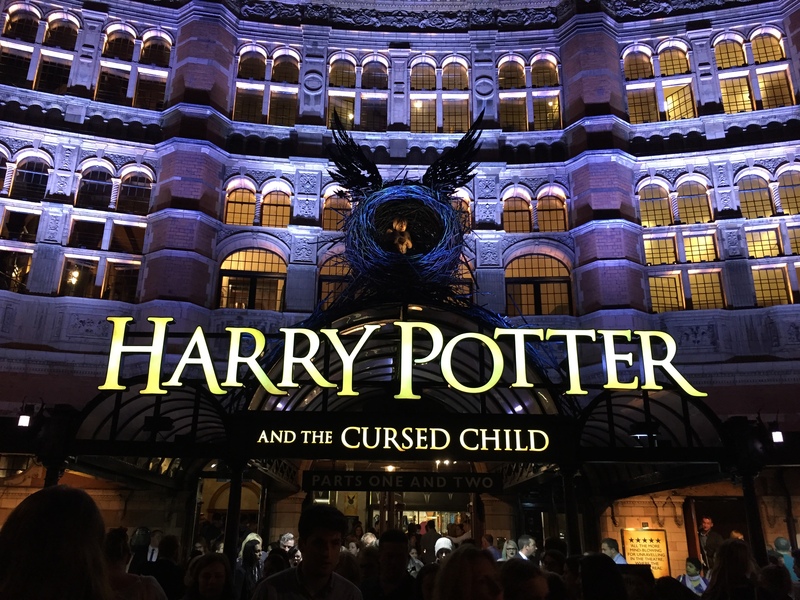 The acts taken by fan participants in these spaces—writing, re-creating, and viewing—show that the acts required to ensure that these memories will continue are in fact happening across multiple cult geographies for the Harry Potter series. Another major consideration for us in these spaces was what was “real” and what was “imagined” for the fandom. For fans of the books and films, “real” is very connected to canon; for most fans, canon refers to the details of the books, and for other fans, details of the films. Whenever a space or place diverges from canon, fans consider this space to be “fake.” Of course, we are talking about spaces that are imagined to begin with, but we should not lose sight of the ways in which fans judge these spaces. Here we recall Roger C. Aden's (1999) writings about fan pilgrimages, explaining that these are “purposeful, imaginary-yet-real journeys” that are important to these fans (p. 79) . Second, we worked to explore ideas of what was “real” for fans of Harry Potter. To do this work, we have tried to interrogate the ideas of a “real” being associated with "canon" (the books and films of the Harry Potter series) because, of course, these are real spaces that we visited and the books may, in fact, be the imagined space. Of all of the spaces that the research team visited, The Elephant House was the most open to this kind of participation. 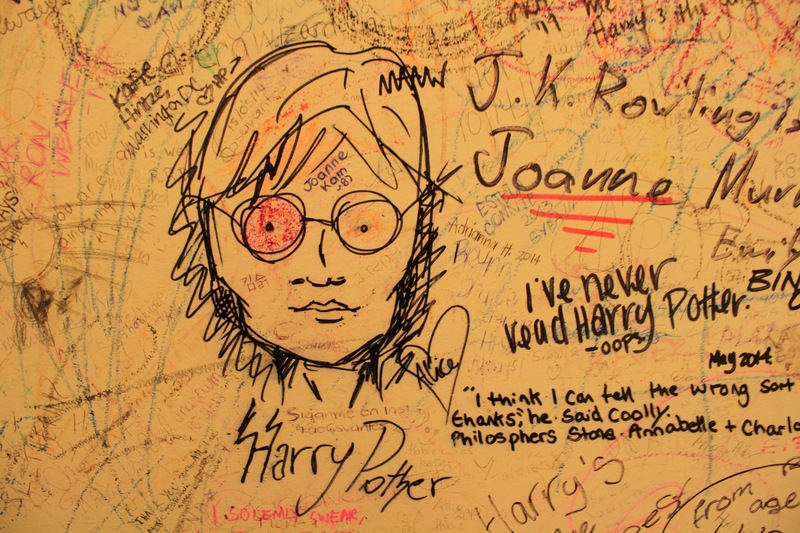 As the self-proclaimed birthplace of Harry Potter, many fans of the series see this space as not only a sacred space for the series’ origin but also as an unparalleled connection with the author herself. 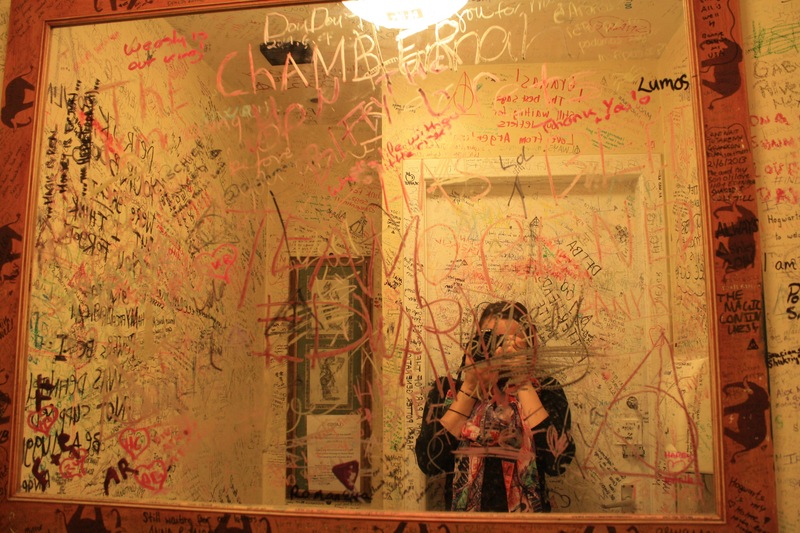 In particular, the bathroom had become a space to leave these memories. Here, fans spoke of their loyalty to the series, their excitement over being in this space, and their personal journey. 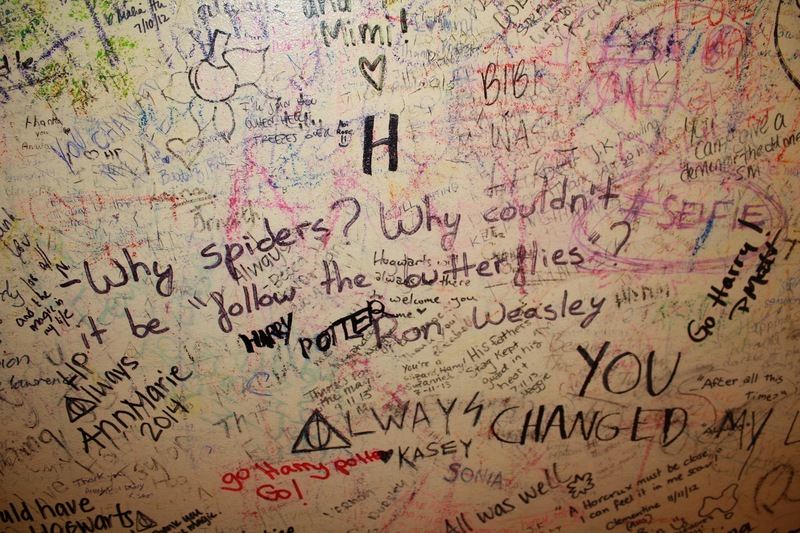 Many of the scrawls covering the walls include thank-you notes to Rowling, while others spoke directly to the characters. 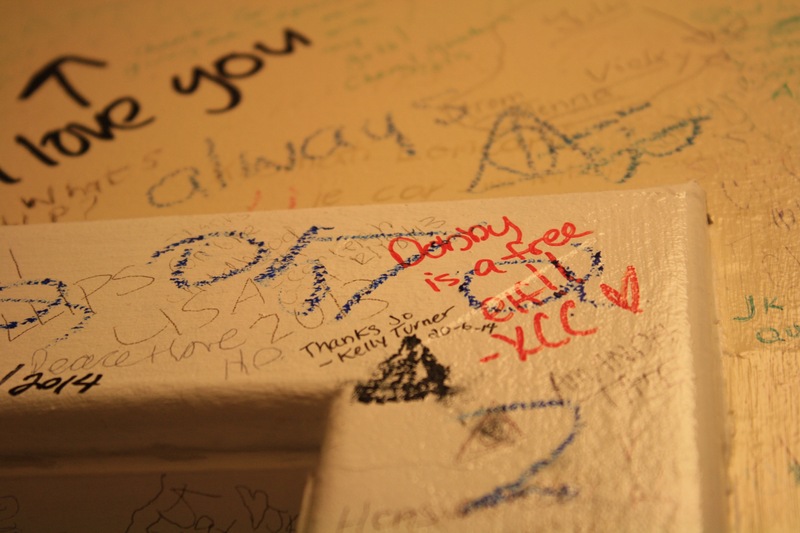 We had the opportunity to add our names to the thousands already on the bathroom wall. 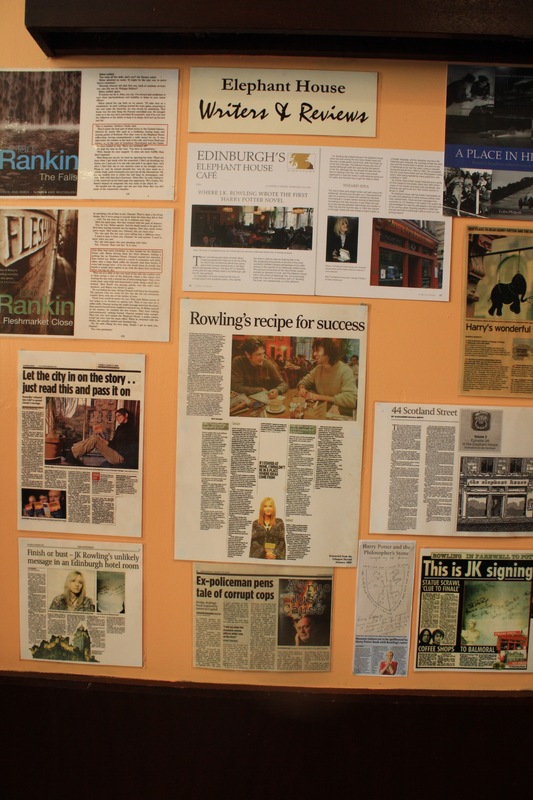 The visit to the space was crucial to us as fans and as researchers; we were able to literally see the history of participation in the Harry Potter fandom over the years. This visit to The Elephant House was magical because of the sense of authenticity, fan participation, and welcoming atmosphere for fans. Here, we could explore Charles Bazerman’s (2003) idea of how writing occurs out of a sea of former texts (p. 83). 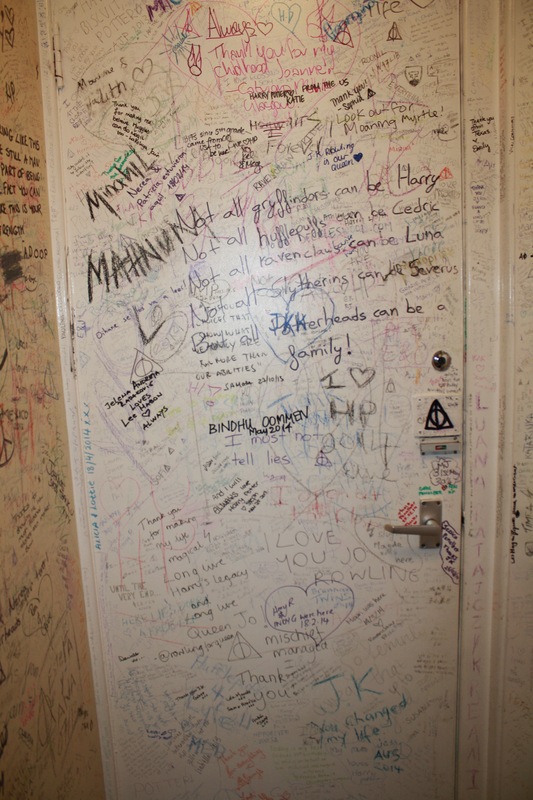 It was evident that fans were writing on top of each other (literally, there are layers of writing in this space), connecting to each other (replying to other posts on the wall, using arrows to direct ideas), and reinforcing the memes of their community through catchphrases and inside jokes about the canon. While the Warner Brothers Studio Tour included a guided portion at the beginning to control crowd numbers, fans are free to roam and experience the rest of the space on their own. Kelly, who had made the trip on her own, was able to take her time wandering the grounds, deeply reflecting on her experience. There, she was more aware of how other groups interacted with the sets presented on the tour. She found fans were content just to be in the space. For example, there was a woman who sat in the corner of an exhibit room and knitted what looked like a scarf. When Kelly looked at her, she simply beamed as if this was the best way to spend her day and continued knitting. This level of contentment and happiness was expressed by the vast majority of fans she met during this visit. When Liza visited the studio tour with her study abroad students in 2016, they were struck by how peaceful the space was, how in awe the fans were, and how the space becomes a cult geography (Hills, 2002) of sorts because of the objects it houses—not because of its physical location outside of London. Existing as a museum and studio tour, the space is important to fans of the films. That it took us a train ride and bus ride to reach the studio from our flats in London added to the atmosphere; we could envision the same kind of journey made by the characters going to Hogwarts. As the tour began, we walked through a mock entrance of Hogwarts and entered the Great Hall, a scene of many a meal, announcement, and eventually a battle in the books and films. This “imagined” space was made “real” by the studio sets and our appreciation of them as a way to experience what the characters experienced. Places that were not considered “active” fan spaces did not allow a good opportunity for fan participation. 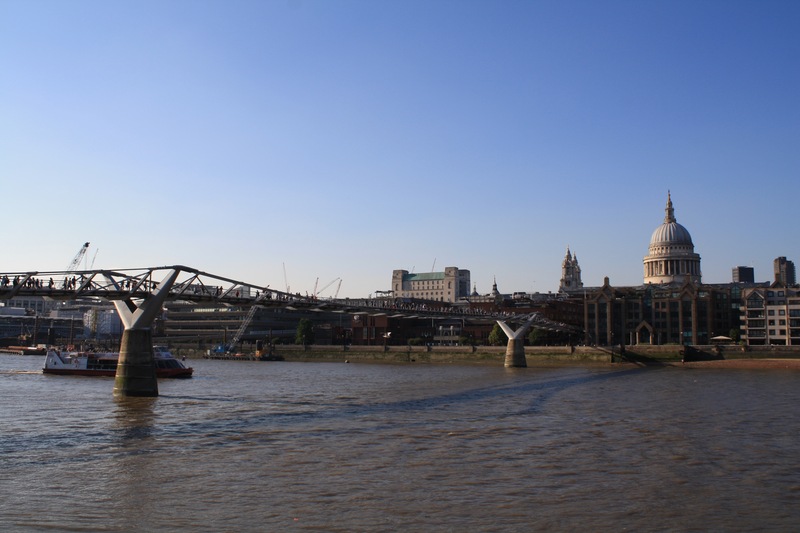 We found that the Millennium Bridge, where a notable scene in the sixth film was shot, and the building that stood in for the Leaky Cauldron in the first film were not popular spaces for fans to visit and participate. 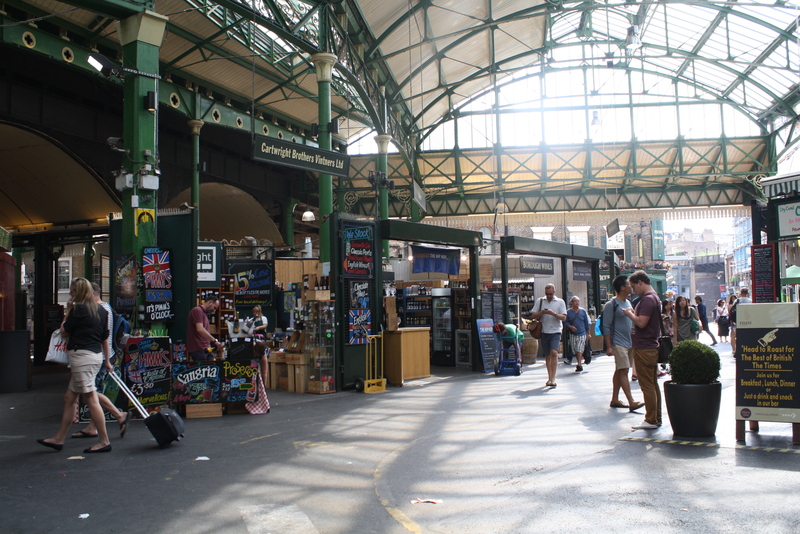 Both sites were strictly spaces where the films were shot and didn’t provide an environment for fan engagement; business people and tourists came and went in these spaces, there to either commute or take in the Thames or shop nearby. While fans may make pilgrimages and look for signs of their fandoms, life moves on for others in these spaces. 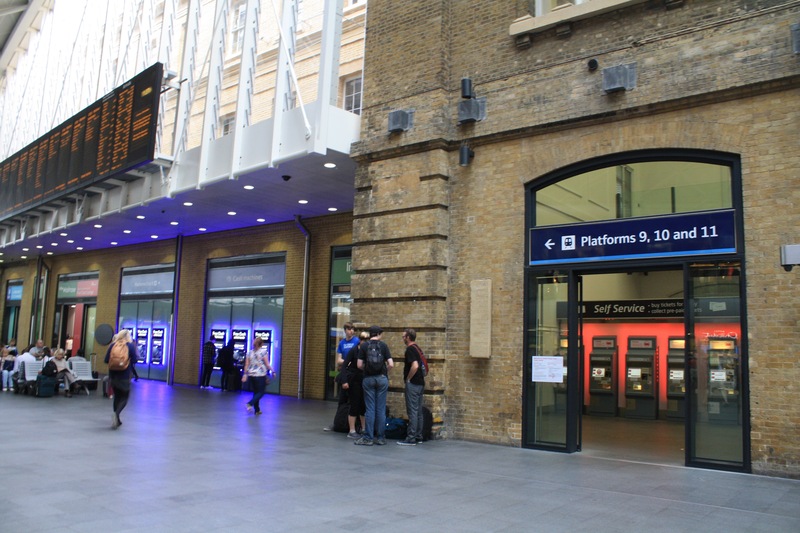 Similar issues arose at Platform 9¾ at King's Cross Station, with the added negative of it feeling like a space of consumerism rather than participation. The heavy presence of consumerism conflicted with the students’ desire to interact with the space. 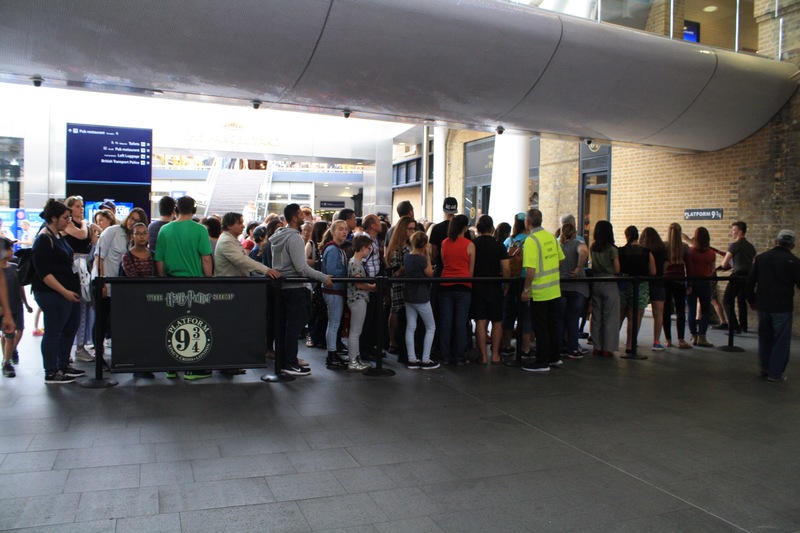 At the Warner Brothers’ imagined Platform 9¾ at King’s Cross Station, visitors are greeted with a re-creation of the space where Hogwarts students would race through the barrier between platforms 9 and 10. The space is complete with a trolley carrying a suitcase and an owl’s cage buried halfway in the wall. If you purchase a ticket, you can have your photograph taken by staff. The conflict between fan experience and fan consumerism for the students was very apparent—`visitors had to stand in line for lengthy amounts of time, be pushed into participating in the same activity as the person in line before them, and weren’t able to hang around the space once their picture was taken. Instead of a space that was “fan-led," established and driven by fans, the space felt “fan-pushed,” where the experience felt forced and fake because it was so detached from the fan space. As fans who mostly enjoy fan-led experiences, we felt we needed to visit Platform 9¾ on our own, after the official visiting hours, in order to fully experience it. We visited with a group of Harry Potter fans around 10 p.m., when only the sign that said “Platform 9¾" and the prop trolley was up. Our group was able to linger in the space, personalize our own pictures, and reminisce on our attachment to this sacred space. This after-hours experience felt much more personal because we were able to create our own memories and attach our own narrative to the space instead of having a commercialized experience. This conflict speaks to this issue of “real” and “imagined” spaces as the students noted that this space seemed false to them because of the pay-to-play reasons mentioned above. Instead, they sought out the “real” barrier between the two platforms, but were not permitted to enter that section itself because they were not ticket holders. That small example of a Michel de Certeau (1984) strategy (the train officials barring entry into the “real” space while the content producers create an “imagined” space for fan tourists) and tactic (student fans rejecting the fan-pushed experience in favor of the “real” experience of the platform itself) sums up why this space did not work for our fan scholars and scholar fans. Fans judge these spaces by how authentic they feel to them. A space that does not meet the requirements of authenticity can be seen as fake, providing a false experience that takes them away from the real space for that fandom. Approaching this project as fans, we understood that opinions and views about the series differ from person-to-person, so we expected fan experiences to differ from space-to-space. In regards to the project, we made sure to be mindful of other’s experiences as we became careful observers in each space and not just focused on our own experiences. We had to take off our fan goggles and try to experience these spaces without the fan filter. However, we knew it was important not to remove our perspectives as fans altogether - we needed that emotional investment in order to dig deeper and reflect more genuinely. We ended up visiting spaces multiple times in an effort to not restrict the space to one memory or experience either. This research experience encouraged us to look at each space in two different ways - as a researcher and as a fan.